Apologies for poor image quality. Born to a family of fishermen on 1 October 1857 in Poulton-le-Sands, which is now called Morecambe; both his parents also came from the same village. In 2001, a Poulton resident found that Woodhouse had previously lived at the same address in Poulton Road. Appropriately, there is now a wall mural on that house as part of the Poulton Heritage Mural Trail. After his marriage in 1892, Woodhouse moved into a house in Chatsworth Road named ‘Kenilcote’, which he designed himself. It is featured in his oil painting, The Reaper (at the top left, the white side gable). Chatsworth Road was then in a rural setting, but was soon engulfed by the West End housing development. So in 1902 the family moved into ‘Auburn Court’, which again gave them a more rural setting as it was on the extreme south of the Victorian/Edwardian development of the north part of Heysham. Woodhouse remained a Lancastrian throughout his life, based in Heysham. Woodhouse's talent was recognised during his early school years, and he later attended the Mechanics Institute in Lancaster where he took courses in art. He was a distinguished animal painter, having acquired a keen interest in nature at an early age, and is recorded as having studied at the Lancaster School of Art and the Nottingham School of Art. There is evidence that his works were used as examples for art students to learn from. However, Woodhouse was basically self-taught as an animal painter, frequenting the slaughterhouses in order to study anatomy. He painted birds, land and seascapes, a few family portraits and many local scenes around Morecambe, Heysham and the surrounding area. Woodhouse also followed in the footsteps of British animal painter, Sir Edwin Landseer, producing sympathetic and nostalgic portraits of working animals - especially hunting dogs and horses. He was frequently commissioned to paint sporting scenes of game birds and gun dogs at grouse and pheasant shoots during his career. Woodhouse loved the outdoor life and his animal paintings captured the mood and spirit of his subjects. His pictures included 'men at work', shrimpers with their horses and carts, the mussel gatherers on Heysham Skeers, as well as vast hulks of old ships being taken to the ship breakers yard. He also painted scenes from around the British Isles. In 1889 Woodhouse sailed to the Near East where he travelled in Greece, Turkey and other parts of the Mediterranean. He sketched and painted whilst keeping a log of his journey. Before the first World War he painted mainly in oils, some of his greatest works were his sporting pictures, which included his gun dogs, Jess and Turk. Technically brilliant and interested in textures, Woodhouse had a soft realistic style well suited to the depiction of animals and birds. After WWI, when it became more fashionable, Woodhouse painted in watercolour. Increasingly, rural nostalgia with glimpses of country life became a popular form of art. With a great eye for detail many of Woodhouse’s pictures are of historical value as they accurately depict a bygone era. Woodhouse first exhibited, aged 24, at the Lancaster Exhibition and he continued to show there until 1927. His love of his native Lancashire resulted in him rarely exhibiting outside that county, with just two at the Royal Academy, London; works featuring animals native to North America and Canada, Doomed in 1889 and Wolves and Wild Boar in 1896. He also exhibited a few others at the Royal Institute and the Royal Society of British Artists, but he preferred venues such as the Walker Art Gallery in Liverpool, Birmingham, Manchester and in particular, the Lancashire Art Exhibition in Preston, where he showed from 1927 until his death on 13 January 1939. He is buried with his wife, Maria Elizabeth, and daughter at St Peter’s Church in the village of Heysham, a little to the south of Morecambe. He was the father of the artist, Ronald Basil Emsley Woodhouse (1897-1987). Four years after Woodhouse’s death, Sydney Herbert Paviere (1891-1971), painter and etcher of architectural subjects, art historian, author and curator of the Harris Museum and Art Gallery in Preston, organised a memorial exhibition of eighty-nine of the artist’s works. The Fine Art Publishing Company in London made photogravure reproductions of many of his works. The Harris Museum and Art Gallery has examples of his work in its collection as does Preston Museum. 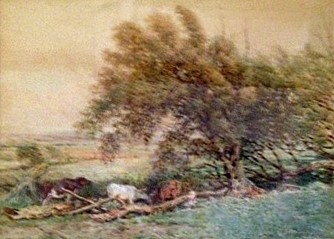 Some of his paintings are also on display in Lancaster City Museum.